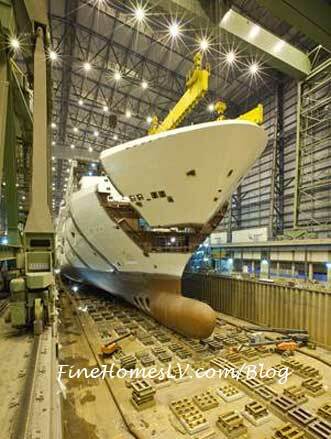 Norwegian Breakaway’s construction, underway at Meyer Werft in Papenburg, Germany celebrated a very significant milestone in the early morning hours on Wednesday, October 17, 2012, when the ship’s bow was lowered into place. The bow, known as block 73, weighed 361 tons, measured 72 feet long, 101 feet wide and over 39 feet high. The process of putting the bow in place was efficiently completed in just 30 minutes. This significant step represents the completion of the lower part of the steel hull, those areas that come in contact with the sea, and indicates that only the superstructures, or topsides of the ship, remain to be finalized. “Placing the bow is a very symbolic and momentous step in the building of Norwegian Breakaway,” said Kevin Sheehan, Norwegian Cruise Line’s chief executive officer. “Meyer Werft is doing an incredible job of constructing our most groundbreaking ship to date in record time.” Entering service in April 2013, Norwegian Breakaway will sail from her year-round homeport of New York City to Bermuda in the summer and The Bahamas & Florida and The Caribbean in the winter.